With 8x8 Group Call Pickup, employees can answer incoming calls for other group members, without requiring the user to walk to their colleague’s phone. Small offices or teams of coworkers sitting near each other can improve productivity with Group Call Pickup. Incoming calls to colleagues can be answered even when the person being called is not at their desk, and employees answering the call can pick it up from their own phone. Group Call Pickup is a great way to ensure calls are always answered promptly and customer service is at its best. Group Call Pickup also works on the Virtual Office desktop app and Virtual Office mobile app, but does not allow remote monitoring. Improve the availability of your teams and workgroups. Incoming calls can still be answered even when the intended caller is not available. Improve productivity within your office. Any call pickup group member can pick up an incoming call without leaving their desk. Ensure that calls are always answered promptly and customer service is at its best. A user can belong to one or multiple Group Call Pickups. Only users with extension numbers assigned can be added to this group. Set up and use Group Call Pickup on its own, or use with Line Keys for additional features. Group Call Pickup does not support remote monitoring. A small office or group of co-workers do not need formal ring group or DID overflow routing, but want to answer calls when the intended recipient is unavailable. In this scenario, users often want to pick up a ringing call from their own desk instead of walking to the recipient’s ringing phone. 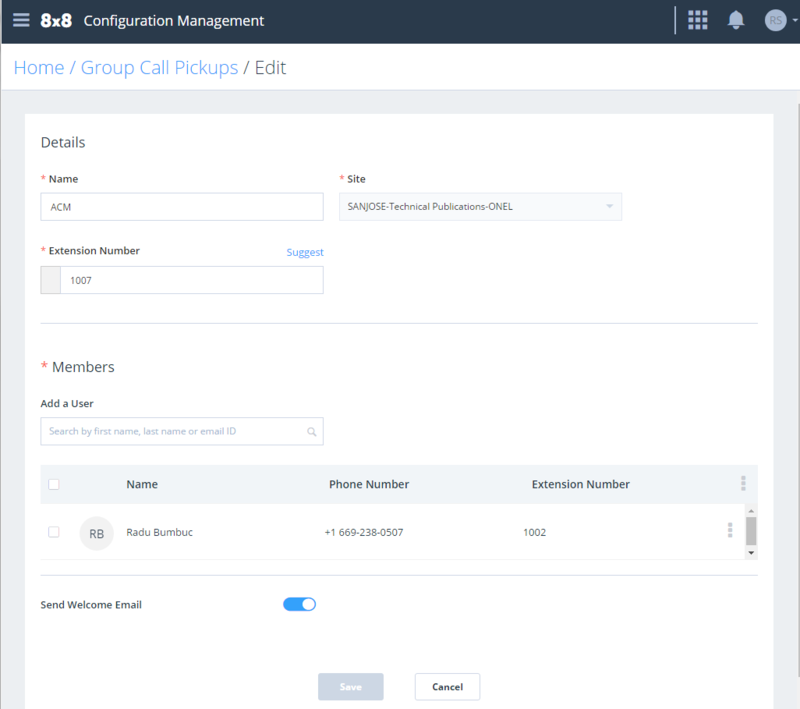 The administrator creates a call pickup group and adds desired extension users to that group. The extension users then receive a pickup extension number via email. When an absent group member receives a call, in their absence, the call can be answered by any other group member using their handset. To set up a group call pickup, you must create a group, dedicate an extension number, and add members to the group. The members are the users in the same site who answer the calls for any other member in that group. Go to Home > Work Groups > Group Call Pickups, then click + Create Group Call Pickup. Enter a Name for your group call pickup, and select a Site, if you have more than one site. Select an Extension Number for the group call pickup. Members use this extension number to answer the incoming calls to the group. Add Members to the group. You can select members from all sites within the same phone system (PBX). - If you remove a member from the list, the user is also removed from the queue membership. - Being a group member denotes permission to answer another user's phone. Enable Send Welcome Email, and click Save. It sends a welcome email to the members of the group including the group's extension number, and instructions on how to use it. How to Use Group Call Pickup? Dial *66 then enter the group call pickup extension. If you have access to Line Keys, press the speed dial key pre-programmed for group call pickup on your phone. If you have access to Line Keys, press the group call pickup pre-programed BLF key on your phone. How do I answer a call that comes to the group call pickup that I am a member of? Users who are part of the same group call pickup can use their own telephone to pick up an incoming call to any other group member. To answer an incoming call to another group member, dial <*66> followed by the group call pickup extension number, such as <1001>. How do I edit or delete a group call pickup? From the main menu, go to Home > Work Groups > Group Call Pickups. To edit a group call pickup, click next to the desired group. To delete a group call pickup, click next to the desired group. Does Group Call Pickup allow remote monitoring? No, remote monitoring is not available for Group Call Pickup. Use BLF call pickup for remote monitoring. Group Call Pickup creates the ability for a group of individuals to pick up a ringing phone without having to physically have access to that phone. Group Call Pickup also works on the Virtual Office desktop app and Virtual Office mobile appbut it does not allow remote monitoring. BLF Call Pickup enables an individual to pick up a ringing call on an extension that he or she is monitoring. This can be a remotely monitored extension. The users do not have to be within earshot of the ringing line. The Power Keys service is required for BLF Call Pickup, and this service only works on supported Polycom desk phones. How do users know they are part of a particular group call pickup? If enabled by the administrator, an automatic welcome email is sent to the members to notify them of the group name and extension number.